Monuments are hybrids, conglomerated things, fusions of materials, in improbable and interesting juxtapositions. They were hybrids in prehistory, when first built, combinations of stone and timber, earth and the void of the ditch, the fluids and excretions of the builders, the bones and blood of the land. So too do our modern interventions hybridise these ancient monuments – if we don’t destroy them first. Injections of concrete. Metallic prosthetics. Synthetic resins and polymer fillings. Patching up and soldiering on. On the island of Bute, three standing stones attest to various modern material additions – concrete, iron, copper-plated steel. Futuristic materials of progress, post-Stone-Age. This weird stone setting consists of three of the strangest mismatched monoliths I have ever seen. Stone A (as I have decided to call it) is a crazy fungal form, narrow at the base, with a bulbous mushroom cloud atop, like a giant stone spoon on the brink of bending, supported on the eastern side by a metal bar. Stone B is a fractured red sandstone explosion of stone, falling into a columnar form more commonly associated with the igneous, not the sedimentary. Stone C juts from a suspiciously symmetrical mound, and upon closer inspection this stone is covered in graffiti, carved into the stone, and is a hybrid of conglomerates and sandstones that form stones A and B respectively. Three of a kind. Dysfunctional triplets. A bit strange. 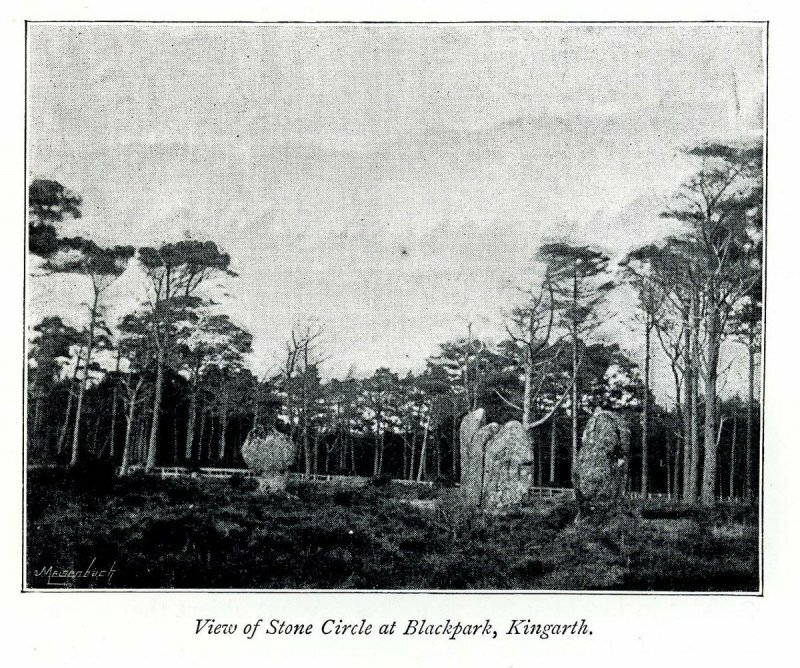 The stone setting at Blackpark Plantation, in the south of the island, sits within a glade of trees. The aforementioned three stones defy any attempt to impose a geometrical order on them as a group – neither a circle, nor a row, although given there are three stones they do inevitably form a triangular setting. No indication of any fallen stones is apparent in the immediate vicinity and limited previous investigations have found no evidence of such although an 18th century antiquarian account suggests four other stones once stood here. As with many megaliths, very little is known about this monument, and its form – remarkable as it seems – has changed little since the 19th century as the above images attest to. Excavation seems to have been very limited, with Dorothy Marshall having undertaken some limited work here when the monument was repaired in the mid-1970s. Stone C (noticeably with no mound around its base in the earlier images) apparently ‘broke at ground level after a gale in 1974’, and was re-erected in a mound of concrete in 1976. 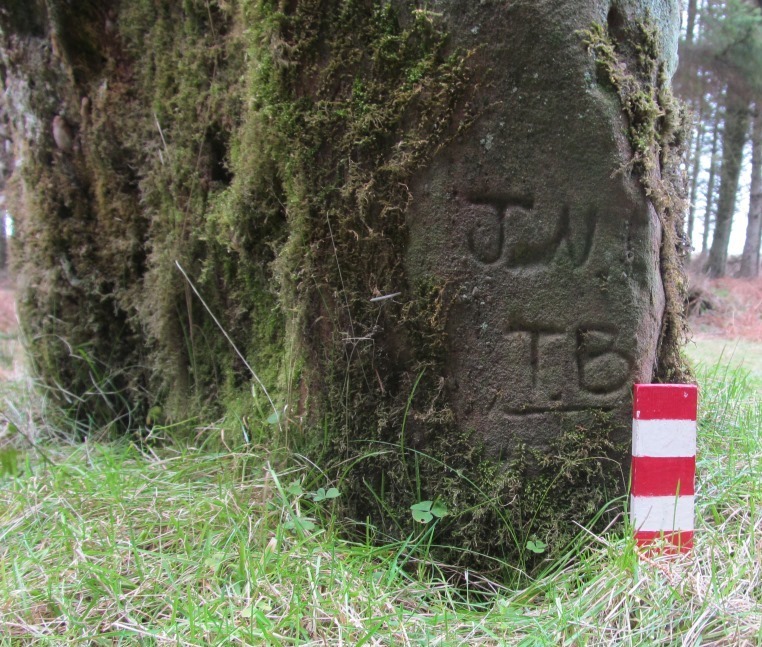 The graffiti that covers this stone consists largely of initials and little symbols – touristic twaddle, pathetic claims of ownership, ‘I was here’ declarations, largely pointless. Here, visitors in the last century or so have made their mark on this stone by subtracting material from it, scraped away with futile endeavour, marks that are themselves now weathering, disappearing, succumbing to lichen and the gales. A cross has also been carved onto the stone, another futile gesture. The concrete mound itself is invisible, grassed over, leaving a standing stone that makes little sense. Stone B has more interesting and enduring new materials, modern additions, not subtractions. Cracks and fissures in the rock show evidence of having coins pushed into them, with some force (one appears to have been hammered in). The coins look to be largely 2p coins, with one 20p apparent. In some cases, the coins have become so corroded that they themselves look ancient, more corrosion product than metal, barely coins at all anymore, illegal tender. It amounts to less than 50p. Here we have the standing stone as slot machine, coins thrust into its very fabric, perhaps pagan acts of hope or supplication, or more likely done with a sense of predictable weariness and cliché, just as one casually tosses coins of low denomination into fountains in shopping malls for ‘luck’. 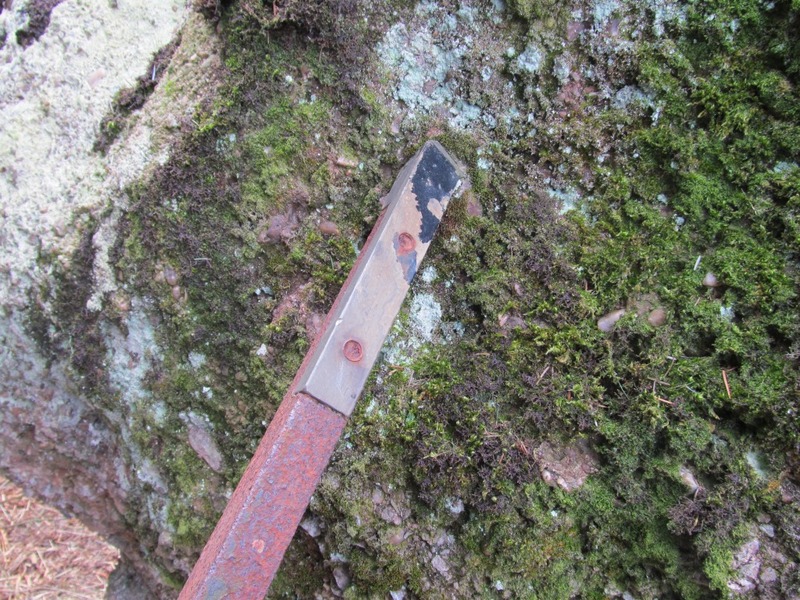 Yet these metal insertions are as nothing to the iron rod that props up the preposterously shaped stone A. For stone A is robomegalith, part metal frame, part standing stone. Without this supporting strut, this stone would fall over, and probably break into two, rather uneven, parts, perhaps a fatal condition. 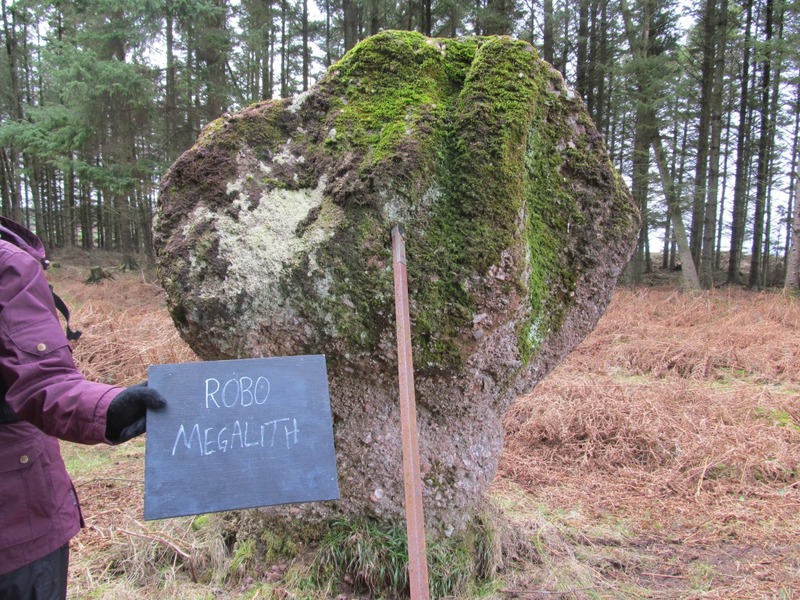 But this megalith was fixed, cured, with the simple preventative measure of the addition of the metal support, affixed to the conglomerate matrix of the megalith by some kind of violent connection. It has become a cyborg standing stone, a synthesis of two different non-organic materials, connected together by the organic growth of rust and lichen. The stone and the iron rod exist in a state of mutual need; without one, the other would fall over and lose its purpose. Together, they have created a new type of standing stone, a standing stone of the future, which will survive into the future (unless it falls over the other way). The Blackpark Plantation standing stones are wonderful hybrids – they combine different lithologies, geological formations and materials. They represent the fusion of horizon between past and present. Their very hybridisation is a source of awful and awe-ful fascination for most visitors. Sources and acknowledgements: the quotation that this post starts with comes from Derek Raymond’s book He died with his eyes open (Serpents Tail, 2007). Lynn Woollacott’s poem appears on her blog (link above) and was originally published in Reach Poetry Magazine 126. The limited archaeological information included in this post comes from the National Monuments Record of Scotland (this is NMRS site number NS05NE 8). The ‘gales’ quotation comes from one of Dorothy Marshall’s two entries on this monument in Discovery and Excavation in Scotland (1975 and 1976), and see also George Geddes and Alex Hale’s excellent short book The archaeological landscape of Bute (RCAHMS, 2010). 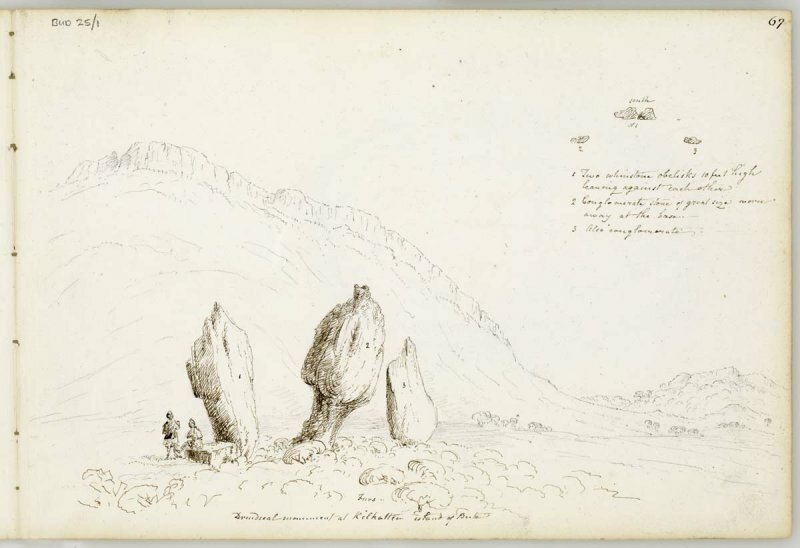 The two 19th century images are: a sketch of the stones by James Skene from 1832, and a photographic view of the monument from 1893; both are available to view via CANMORE (the NMRS) and have been reproduced in various other places. 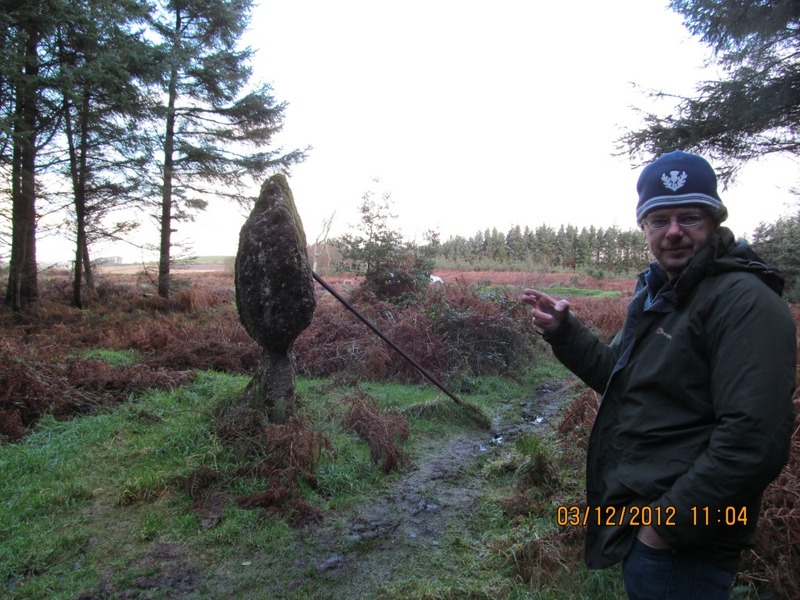 The general view of the site which I amended originally came from the megalithic.co.uk website, posted by Saille. Over the course of the past 18 months, I have visited this monument three times, variously with Paul Duffy, Nyree Finlay, Jeremy Huggett and over 65 Glasgow University students. Thanks finally to Helen Green, who suggested I use the word cyborg – I wish I had thought of that! Brilliant piece of writing and perspective, as always. I swear, if I ever get an archaeo academic job (hah!) I’m putting this blog on compulsory reading lists. Hi, thanks, very nice of you to say so. I actually do recommend it to the students I teach, although I am not sure what they make of it. As for the job, keep chasing the dream! I am gutted I didn’t think of that before you! Lynn, thanks so much for getting in touch, and I am glad you liked my post. 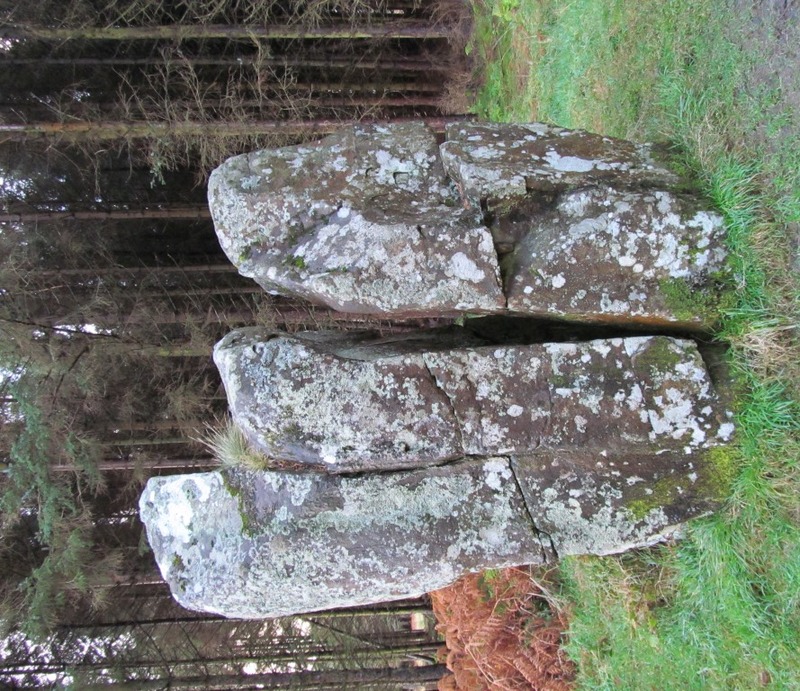 I am delighted that you were inspired by these stones, as an archaeologist I am inspired by them every time I visit, and part of this is because of their strangeness, and their strange beauty (a property inherent in most standing stones, I find).